CHICAGO — When Debra Aldridge became her grandson’s primary caregiver, she was making $7.50 per hour as a cook. The alternative for the newborn, she was told, was to put him up for adoption. For more than 11 years, Aldridge, who is divorced and lives in Chicago, has struggled to feed, house and clothe her “baby,” Mario. As she ages, Aldridge sinks deeper into poverty. 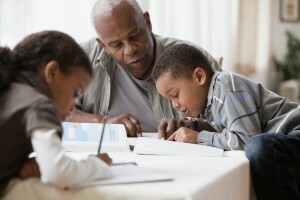 Nationwide, 2.7 million grandparents are raising grandchildren, and about one-fifth of those have incomes that fall below the poverty line, according to census figures. “People who step forward, step forward because there is a crisis in their family and apparently don’t take into account their own limitations,” said Esme Fuller-Thomson, a professor of social work at the University of Toronto, who has researched grandparent caregiving in the United States. Maria Nanos, executive director of the Center for Law and Social Work in Chicago, said that when the state is involved, grandparents receive free legal help from the center, but informal caregivers navigate guardianship on their own. The center usually receives funds from the state’s Department of Aging to help those grandparents. But Illinois has operated without a budget since July, so the center has not received the money this fiscal year. “We have to turn people down,” Nanos said. Some states offer financial aid for informal kinship families. In Georgia, grandparents older than 55 can get a $100 monthly subsidy per grandchild. They also have access to grants and could qualify for subsidies similar to those of foster parents (between $14.60 and $18.80 per day). But access to the assistance, which is often housed in different agencies, can be tricky, if not impossible. To help relatives navigate the complex web of services, some states have created kinship navigators. Lynn Urvina, is one of about a dozen kinship navigators in Washington state. She said grandparents call her seeking information about support groups, obtaining guardianship and financial help to pay bills. Every year, her case files grow. “In our area, methamphetamines have had a huge impact,” said Urvina, who is raising, along with her husband, a 12-year-old granddaughter. Navigators in Washington serve 30 of 39 counties, with multiple counties overseen by one person. Some counties include rural communities where grandparents have little access to services, Urvina said. “If all grandparents walked away and say, ‘we can’t do it,’ there would be no homes for these kids,” Urvina said. To boost assistance to kinship families, Sens. Orrin Hatch, R-Utah, and Ron Wyden, D-Ore., are working on a bipartisan bill that would reimburse states for a portion of money spent on such services as substance abuse prevention and kinship navigators. As her grandson enters his teens, Aldridge, the Chicago grandmother, said she knows she’ll need more resources to clothe, feed and keep him out of trouble. To help make ends meet, she stands in food lines, taking two buses to reach the food depository. But she won’t give up on Mario. “He needs me,” Aldridge said. Alejandra Cancino is studying health care and long-term care issues as part of a 10-month fellowship at the AP-NORC Center for Public Affairs Research, which joins NORC’s independent research and AP journalism. The fellowship is funded by The SCAN Foundation.